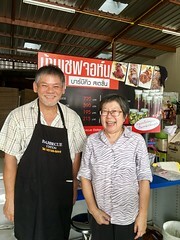 Chef John and his wife (originally from the frog) are back to the food business with ribs in the middle of the old town: BBQ Station is the name. John had a medical condition for the last two years and a half and just started this ribs joint few weeks ago. It’s super delicious!!!! First, it’s not a restaurant. It’s more for take away. Ribs take about 20 Minutes to be ready. So better call before. They also make their own BBQ sauce and homemade pickles. 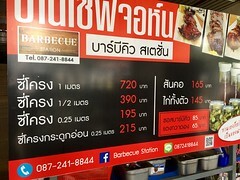 I haven’t tried all ribs in Korat or the world. 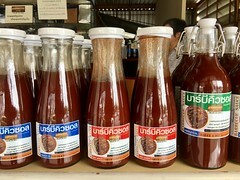 But these are the best ones I had in Thailand. Tender, not overcooked, juicy, really good. It’s sold by length!! 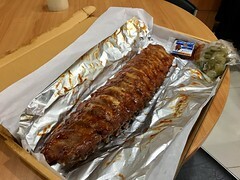 1 meter ribs? half meter? or a quarter meter with or without the extra meat. They will add you some sauce and pickles in your box. 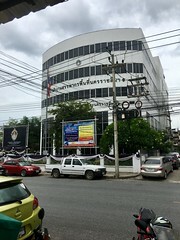 It’s located just in front of the revenue department in Korat. This is beside the big building of Thanachart banks, inside the old city. 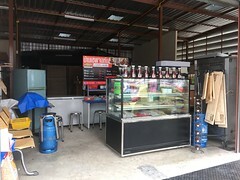 It’s not a fancy place, just a place to get good ribs, take away, and enjoy the magic of a cook who learned cooking at a culinary school in USA. John speaks fluently in English and his wife can also answer in English. Because John’s still not fully recovered, he won’t open a new restaurant soon and just do ribs for the moment.